This makes a huge batch, enough for a Super Bowl gathering. To halve it for normal eating, use 1 pint of whole milk and 1 – 1 1/2 cups stock. To make this a quick weeknight meal, speed up the fixing by getting pre-chopped onions and celery and try using a little bit of Tony Chachere’s Instant Roux instead of making a homemade roux. It’s pretty good though a little salty, so hold off on adding salt until you taste near the end of cooking. Add a few shakes and stir. Don’t add too much at one time or your chowder will need to be cut with a knife and fork! Prep all the ingredients. Place the potatoes in cold water to prevent discoloring. In a large pot set over medium heat, sauté the bacon until the pieces begin to brown. There should be about 1 T of bacon grease in the bottom of the pot. If your bacon was very lean, add the tablespooon of olive oil. Add the onion, and celery, and saute until the veggies soften. Deglaze the pan with a splash of the chicken stock. Use enough to stir up all the tasty brown bits. Add the parsley, creamed corn, sweet corn, drained red potatoes, milk, the rest of the chicken stock, Tabasco, black pepper, and salt. Stir well and bring to a low simmer. Reduce the heat to low, cover and let cook for about one hour. Stir frequently. Do not boil. After the roux is done and has cooled just a bit, add it to the pot. Stir to incorporate. Recover and cook over very low heat for about 20 minutes. Serve with a deliciously buttery baking powder biscuit or if you prefer to use lard or shortening, a traditional baking powder biscuit. 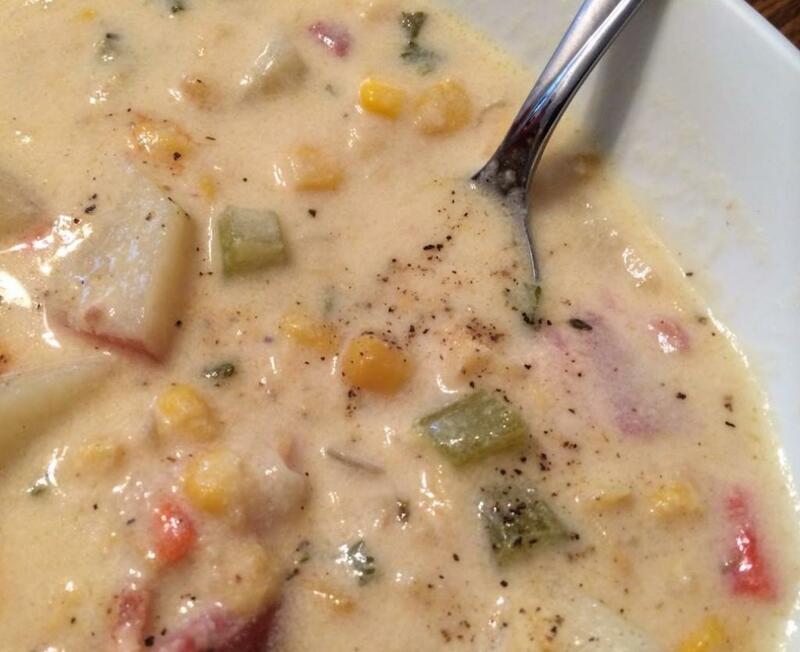 This entry was posted in Main Dish, Stew, Vegetable and tagged chowder, corn, creamy, potato, Soup, Stew. Bookmark the permalink.